The White Queen mine is famous for beautiful crystals of pink beryl (the gem variety “morganite,” named after financier J. P. Morgan). The pictured 7.9-cm crystal, found in 1964, may well be the best ever found there. It has good color, no damage, a glassy luster on the big hexagonal “c” face, and interesting crystal form, and it rests on a base of white albite crystals. 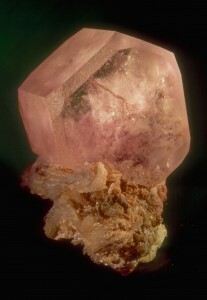 Peter Bancroft, in his World’s Finest Minerals and Crystals (1973), considers this specimen to be the world’s finest example of pink beryl (although fans of examples from Madagascar and Brazil might put up an argument).